The Student’s t-test is a statistical test that compares the mean and standard deviation of two samples to see if there is a significant difference between them. In an experiment, a t-test might be used to calculate whether or not differences seen between the control and each experimental group are a factor of the manipulated variable or simply the result of chance. The unpaired T-test would be used to determine if there is a significant difference between the control and treated enzyme activities. The paired T-test would be used to determine if there is a significant difference between the pre- and post-treatment blood pressures. The T-test is a test of a statistical significant difference between two groups. A "significant difference" means that the results that are seen are most likely not due to chance or sampling error. In any experiment or observation that involves sampling from a population, there is always the possibility that an observed effect would have occurred due to sampling error alone. But if result is "significant," then the investigator may conclude that the observed effect actually reflects the characteristics of the population rather than just sampling error or chance. "There is not a significant difference between the two groups; any observed differences may be due to chance and sampling error." There is no significant difference between the control and treatment group enzyme activity; the difference we see in the means of the two groups may be due to chance and sampling error. 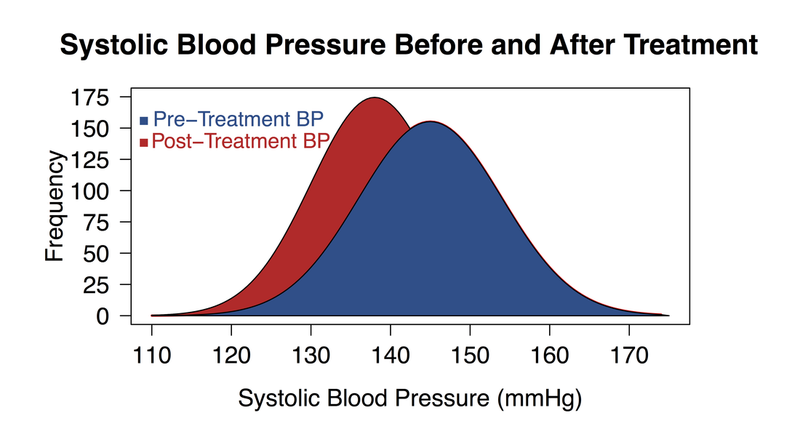 There is no significant difference between the blood pressure before and after treatment; the difference we see in the means of the two groups may be due to chance and sampling error. "There is a significant difference between the two groups; the observed differences are most likely not due to chance or sampling error." There is a significant difference between the control and treatment group enzyme activity; the difference seen in the means of the two groups is mostly likely not due to chance or sampling error. There is a significant difference between the blood pressure before and after treatment; the difference we see in the means of the two groups is mostly likely not due to chance or sampling error. Divide each squared standard deviations by the sample size of that group. Take the square root of the number to find the "standard error of the difference. Divide the difference in the means (step 2) by the standard error of the difference (step 7). The answer is your "calculated T-value." Determine the degrees of freedom (df) for the test. In the t-test, the degrees of freedom is the sum of the sample sizes of both groups minus 2. Determine the “Critical T-value” in a table by triangulating your DF and the “p value” of 0.05. If your calculated t value is greater than the critical T-value from the table, you can conclude that the difference between the means for the two groups is significantly different. We reject the null hypothesis and conclude that the alternative hypothesis is correct. If your calculated t value is lower than the critical T-value from the table, you can conclude that the difference between the means for the two groups is NOT significantly different. We accept the null hypothesis. Sometimes it is nice to check your answers to make sure you are doing the calculations right. Use this website to check your results. Select option 4 to clear any past lists of data. Select option 1 to EDIT your lists. In our class, the formula we'll want to use is =TTEST(A1:A4, B1:B4, 2, 3). Replace A1:A4 with your data from the first sample and B1:B4 with your data from the second sample. 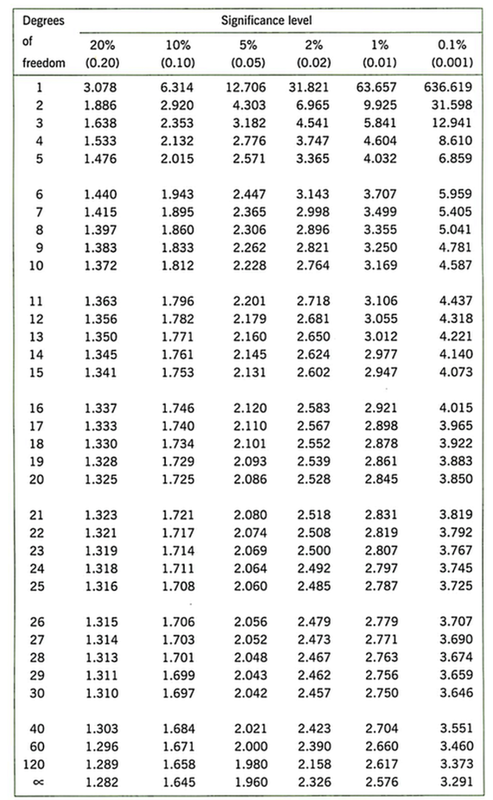 Click on another blank cell where you wish the P value to appear. Then click “fx” on the Excel Formulas toolbar. For “Array1” highlight the data from one sample; for “Array2”, highlight the data in the second sample. Lastly, you will have to select the “Type” of t-test. For our purposes, we will mostly use type “2.” Although, if you are measuring the same sample at two points in time (for example before and after treatment) then you would have a type "1." 5. After answering these questions click “OK” and the P value will appear. The P value will fall between zero and one. What does my P value mean? Excel gives the chance that the differences between the two samples are due to random chance alone. If Excel calculates a P value of 0.22, it means that there is a 22% likelihood that the difference in the means of your two data sets is due to random chance. Normally will say that a P value of .05 or less is significant in which case we reject the null hypothesis (accept the alternative hypothesis). If the P value is greater than 0.05, we accept the null hypothesis and conclude that there is no significant difference between the two groups.